Combine couscous, green onion, jalapeno, olive oil, cumin, cayenne pepper, and black pepper in a large bowl; stir until olive oil is completely incorporated. Bring vegetable stock, asparagus, and peas to a boil in a saucepan over high heat. 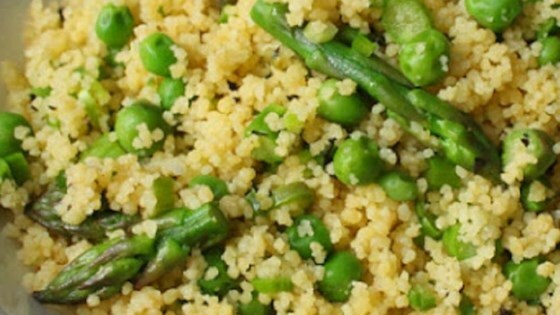 Pour stock, asparagus, and peas over couscous mixture; shake bowl to settle couscous into liquid. Cover and let stand for 10 minutes. Fluff with a fork, then stir in mint and season with salt and pepper to taste. I loved this recipe - definitely going to be a go-to for the summer. I did sub cilantro for the mint and served with some grilled shrimp - so good! I made it exactly as instructed and found it very dry and rather bland despite all the spices. This dish has several things going for it; easy to make, inexpensive, colorful, and very delicious. This is a definite keeper for my recipe box.